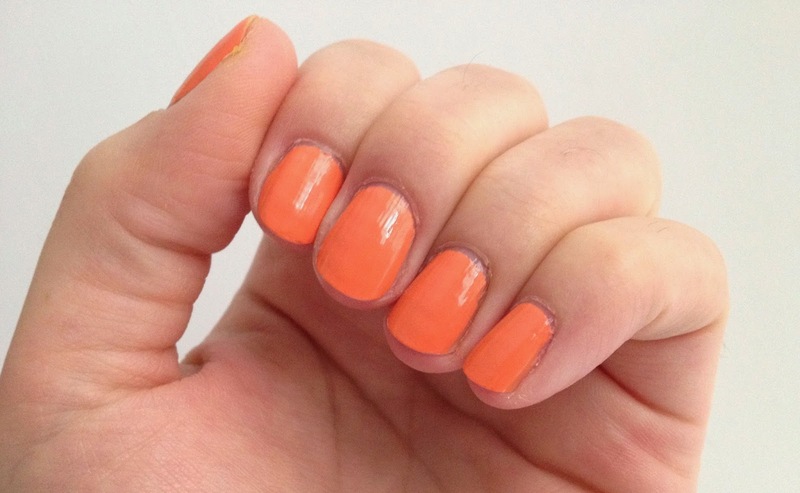 My Beautopia: Summer nails: OPI Where did Suzi's Man-Go? OPI: Where did Suzi's Man-Go? I was lucky enough to be invited to a special charity nails event the other night. A friend is fund raising for charity and hosted a wine and nails evening - I didn't have to be asked twice! It was a real treat for me to have my nails done professionally and for once I have immaculately applied nail polish. I had the choice of the full range of OPI polishes and being some what spoiled for choice I decided to go bright! The colour I plumped for was called Where did Suzi's Man-Go from OPI's Brazil collection. Where did Suzi's Man-Go is a bright light orange/mango (get it?!) colour which is perfect for summer. The nail technician showed me that she had it on her toe nails and it looked amazing, and despite the distinct lack of summery weather at the moment I wanted it on my nails too. It needed two coats to be fully opaque and not patchy and I love how bright it is! The bright colour has been cheering me up in the past few drizzly days and I know that it would be a perfect shade for sunny summer days too. What are your favourite nail polish shades for summer? OPI's Where did Suzi's Man-Go? is £11.95 with free delivery from Look Fantastic HERE.